There was a delay in posting this because this week is the 4th monthly exam of Jeffrey so I need to guide him for the review of his 8 subjects. Anyway, so much of the waiting, here are the pics that we wanted to share with you guys! I like the print-out of this tarp, lumabas siyang matingkad ang color. We printed some sketch for those guests who are not familiar with the place. Grabe it took me months to complete the items that I included inside. I put them in a small bag that I included in the backpacks. So here is the complete items inside the backpack. The guy wearing a yellow shirt is one of the staff na nag-set-up ng cake and the cupcakes. Ang sarap ng cake at super bigat niya, siksik na siksik not unlike other cakes na magaang at puro hangin. Nasarapan din ang mga guest sa flavors ng cupcakes. 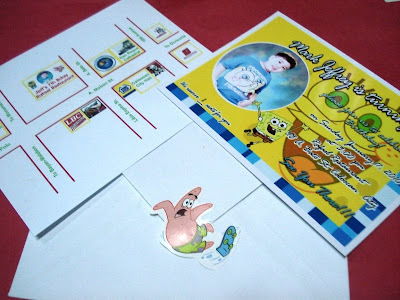 Here are the souvenir cupcakes with Sponge Bob and Patrick toppers. Same flavors with the cake. For the balloons, I asked Janet to do it for me. I wanted to have a balloon decor for the venue. The camera shy Janet and her assistant. Here are the balloon centerpieces. Kids singing the Birthday Song... alive na alive ang mga kids sa pagkanta! I really wanted Rafael Restaurant to be the venue of the party because I know that my guests will love the food. Puro specialty nila ang pinili ko na wala sa package nila pero pinagbigyan naman ako. I so love Ate Bhaby! Talagang na feel ko na special yung service na ibinigay nila sa amin. Thanks also to kuya Boyet, Elvie, kuya, (the waiter who assisted us in the morning set-up 'till it ended around 6:00 pm) and to all the staff who help us in the preparation. We prefer Filipino food for the buffet... All the guests were satisfied with the food. Madami ang bumalik for second round... hihihi! The best Beef Kaldereta I've ever tasted! Lechon Kawali was a hit too! Dessert was Ube Gelatin and the soup was Crab and Corn Soup. Ooops! I'm craving for the ube gelatin just by thinking of it. The tandem of Goyong and Kuya John Paul was a hit to the kids and adults. Sobrang nakikinig ng husto ang mga kids sa puppet show! My bunso really enjoyed this part! and now.... the magic show! 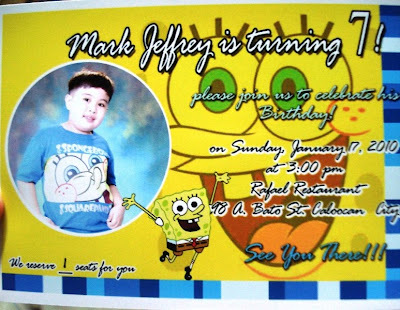 Thumbs up to mommy and daddy sa party ni Jeff!! I'm sure the guests enjoyed that wonderful party! the near future but I'm having a hard time choosing between BlogEngine/Wordpress/B2evolution and Drupal. The reason I ask is because your design and style seems different then most blogs and I'm looking for something unique. blog (I also love the theme/design), I don't have time to read through it all at the minute but I have bookmarked it and also added your RSS feeds, so when I have time I will be back to read a lot more, Please do keep up the fantastic work. Hi there to every one, as I am genuinely keen of reading this webpage's post to be updated on a regular basis. It carries good material. I read this post completely concerning the resemblance of newest and preceding technologies, it's awesome article.